We offer a variety of paving services, including patio paving, for clients in Mooresville. Patio paving can be a complex process, especially if it’s done by someone who isn’t familiar with the necessary steps. Instead of hiring an inexperienced paver or attempting this process yourself, trust the professionals at Lake Norman Signature Pools & Patios. We offer a variety of paving services, including patio paving, for clients in Mooresville, North Carolina. When you entrust your backyard redesign to us, we don’t take that lightly. Our skilled team will start the process by coming to your property and providing a free estimate for the new patio. 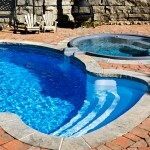 We can also go over options with you, such as stained or stamped concrete to create a unique, custom look. After we have provided you with the estimate, you can make the decision as to how you want to proceed. Upon deciding to proceed with the installation of your new patio, we’ll get started right away so you can start enjoying the outdoor space as soon as possible. If you choose stained concrete, we can offer various shades to complement the exterior of your home as well as any landscaping that you may have out there. In addition to patio paving, our skilled concrete construction professionals can handle paving of other surfaces in your yard. One area that we excel in is fire pit paving, which can create a pleasant and warming atmosphere on chilly evenings. Give us a call to find out what we can do to transform your outdoor space. We look forward to working closely with you and exceeding your expectations!